Things become very lengthy when we choose any configuration management tool for managing multiple servers. Just imagine, what if we get something which allows us to start automating tasks just after installation? While hunting for a way to automate all administrative tasks and for deployments with less efforts and time. A lot of our consulting and training clients request us to help them interview for cloud professionals, especially in AWS and Azure. There is a high demand for cloud professionals and sometimes the interviewing Hiring or Learning Manager herself does not have the experience in these technologies to test the skills of the interviewee. Oracle’s Cloud Strategy Based on High Licensing Fees and Free On-Premises Hardware: Will it Work? Oracle has been investing heavily on its cloud technologies. I recently attended their Oracle World Conference in Delhi and came out impressed with the catchup it has done with Amazon Web Services (AWS) and Microsoft Azure. 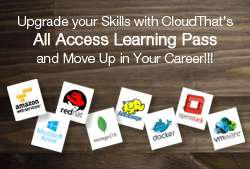 Preparing and appearing for Red Hat Certifications is a challenging task. One must prepare well for the 3 hours of rigorous practical exam and also need to take the stress of booking a Test Centre.3 years ago, when I started my journey with Red Hat Certifications, getting a Test Centre for a preferred date was one of the biggest challenges. AWS is providing its customers a very fast cloud-powered business intelligence service – QuickSight. It enables business users to peer inside the data residing in various AWS repositories, including RedShift Data Warehouse, Elastic MapReduce and Amazon Relational Database Services. Before I proceed, we at CloudThat are partners with both Amazon and Microsoft, and we work with some great people at both the companies.At CloudThat, we pride in being a vendor neutral provider of Cloud Consulting and Training, and we only work in the best interest of our clients and their requirements. In this blog article, I will explain about Microsoft Azure certifications. As per the current market trend, IT professionals with knowledge and experienced in Azure are in high demand. Based on the job role, professionals can decide their certification in Azure. OpenStack has become the de-facto private cloud solution in today’s market. OpenStack Certified Professionals are in high demand, but for an average IT infrastructure engineer, OpenStack is not simple. I have recently appeared for Microsoft Azure Exam 70-534: Architecting Microsoft Azure Solutions. I am glad to say that I have passed the exam. In the next few sections I shall share my experiences about this exam.